Primary Natural Resources petroleum, timber, tin, antimony, zinc, copper. A KITE-SHAPED country with a 1,243-mi (2,000-km) north-south stretch, Myanmar has its apex in the north, bordering INDIA and CHINA, and a tail that extends for 900 km (559 mi) in the south. 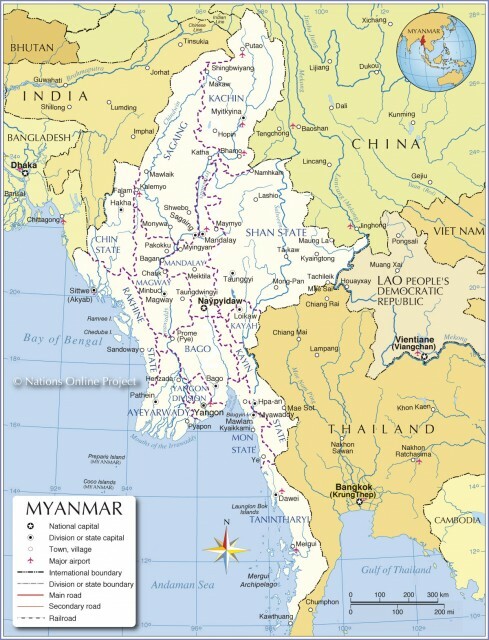 The British colonized the area known as Burma in 1875 and ruled it mainly as a province of India. Japanese occupation in 1942 lasted for three years, after which the British regained their colony, only to hand over power to the Aung San-led antifascist People’s League in 1948. During the British period, most administrative, rail/port operations, postal, banking and trading activities were handled by Indians, who constituted 8 percent of the population. Moreover, exposure of Burma to the foreign market induced the IRRAWADDY delta-based farmers to produce surplus rice, and the country became the leading rice exporter in the world. In 1940, Burma was exporting 3 million tons of rice annually. The country has not regained that position because of increased demand in the local market and the impractical policy of the “Burmese way to Socialism,” which introduced a command economy. Following independence in 1948, Burma had elected governments, but since 1962, it has been ruled by military dictatorships. After being pressured by the United Nations, the country held a national election in 1990, resulting in 82 percent of the parliamentary seats being won by the Aung San Suu Kyi-led prodemocracy party, the National League for Democracy. Aung San Suu Kyi is the daughter of the “Father of the Nation,” Aung San. She was awarded the Nobel Peace Prize in 1991. The 1990 election was invalidated by the military junta and Suu Kyi was put under house arrest. Brutal suppression of free expression still continues. Starting in the 1970s, the agricultural High Yield Variety (HYV)-based green revolution technique has been widely used, resulting in increased rice production. Some analysts believe Myanmar seems to be well on its way to reclaiming its previous position as the world’s premier rice exporter. Myanmar is primarily an agricultural country, with 60 percent of its gross domestic product coming from agriculture, while 78 percent of the labor force is engaged in that occupation. Industries, including agricultural processing, knit and woven apparel, wood and wood products, textiles, and pharmaceuticals employ about 7 percent of the population. Myanmar had been producing petroleum since before World War II. The present production, however, remains stagnant. Twenty-five percent of people live below the poverty line. High adult mortality from HIV/AIDS is slowing the population growth rate.